It is now when at long last I have some free will to dedicated to my blog. After this morning post about Bill the Kid, I am going to pay tribute to a couple of events I completely avoided talking about from the past two months. Thus, in this post I’ll talk about Tulane University’s Tech Day of September 27th, and in the next about our TEDxUSagradoCorazón of October 18th and the STEMmED Colloquium of the 17th. So, how can I begin telling about one of the most spectacular trips ever made? I was in New Orleans for just a few days, guest of Mike Griffith of Tulane University. Well, ever since stepping into the hotel (a great place just beside –coincidence!– the famed Piazza d’Italia, a tribute to Italian immigration into the city) I received the most lavish guest hospitality package ever. 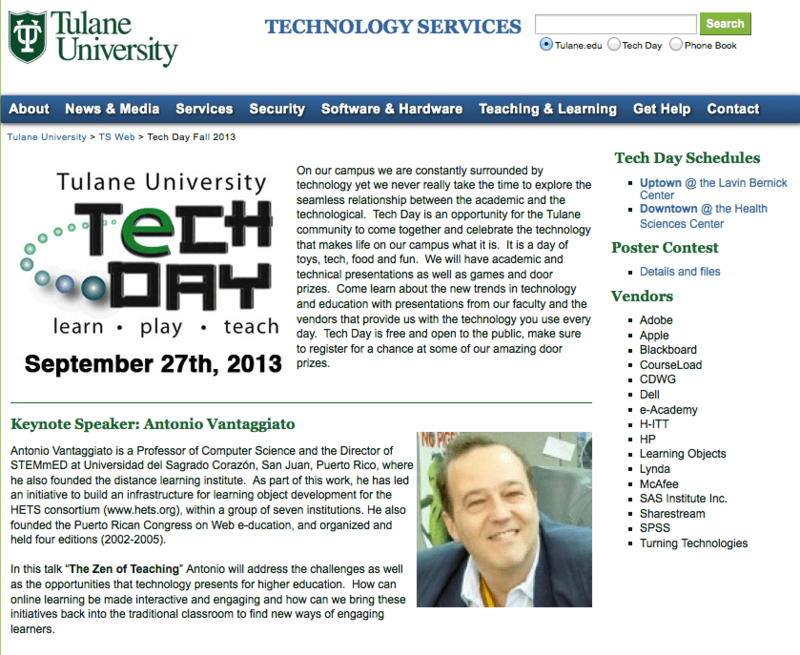 I was invited by my friend Mike to talk about my Zen of Teaching project and the myths of teaching, learning and technology in Tulane’s Tech Day 2013 event. First, I met awesome people with whom I also had awesome drinks. Of course, besides being Faculty Technology Coordinator at Tulane, Mike is my Martini Guru, so I try to perfect my learning as often as possible with him. The best ever drink, however, was the Sazerac —read its story here–, a mix of Rye whiskey and absinthe. In 1912 absinthe was banned, I believe almost worldwide, but today it came back. Yes, when sipping it I was thinking not only of vampires and Bourbon Street, but of Rimbaud and Verlaine, who loved sipping it. We had one just before dinner at the gorgeous two-story house-mansion-restaurant Clancy’s, another NOLA’s classic places, which is where to eat fried oysters with brie and other delicacies. I met and had a delicious time with Charlie McMahon, Vice President for Information Technology & Chief Technology Officer at the Café Adelaide, part of the famed Commander’s Palace, together with a fantastic, sherry-showered turtle soup. In fact, I also appreciated Charlie’s talk –a roadmap of IT throughout the year– which was scheduled just before mine. The Campus of Tulane is quite nice, with functional, simple and beautiful buildings, offices and halls, though I had just the time to visit a part of it only. And my talk itself was I believe just good enough for such a public. My English worked well, of course with accents from my two mother-y tongues. I had a lot of fun when speaking about the Zen of Teaching (immodestly enough) and happy to be able to bring it around. Also, Mike’s Staff were great professionals and I enjoyed working with them and, later, eating dinner in their company. I felt really well, and pampered, during my stay in New Orleans. Thanks! 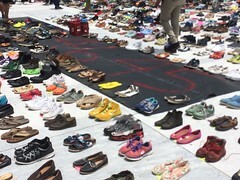 This entry was posted in general, myths, travelz, zenofteaching and tagged myths, travels, zenofteaching. Bookmark the permalink.